The bride wasn’t ‘given away’ like chattles, bride and groom walked down the isle together. I promise to allow myself to be silly around you and to enjoy you being silly around me as well. A photobased childrens TV themed Quiz organized by table at the wedding breakfast. Bride’s speech toplining the other speeches. Local bands at the reception were friends of the Bride and Groom, some included the Bride or Groom and all played at least one cover version of Bond theme tune, compared by AFH. My yellow-red shot silk hat, however, the relative lack of hats on other guests was actually a tad disturbing. 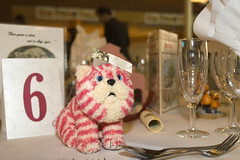 Tables were decorated in childrens TV themes, with models and soft toys, and each guest as a character, I was Soo. As you can see, even Bagpuss joined the fun. This scribble was published on Monday, September 15th, 2008. You can follow any banter on this scribble with the RSS 2.0 feed. You can share your inspired musings after typing the anti spam word near the bottom of the page. But no Pinging because its too naughty. It was such a fun day, so glad you could come and that you enjoyed it as much as we did! I’m really looking forward to the post wedding hen night, can’t wait!